The field operations for this project commenced in October 2016 and was demobilized late December due to winter ice conditions in the Hudson River. The bid proposal required the removal of 100,000 cubic yards of shoal material from the Albany Turning Basin and Staats Point Reach to a depth of -32’ MLLW with upland disposal via hydraulic unloader pump at Houghtaling Island contained disposal facility (CDF). The project bid in August 2016, and after a lengthy submittal process, work to prepare the USACE owned Houghtaling Island CDF for use began in early October. Preparation work, which included raising all containment berms and dikes to +50’ NAVD88, was completed by BAI’s subcontractor in early November, which allowed dredging and placement activities to commence the first week of November. Pre-dredge surveys revealed the mandatory material to be removed was a much lower number of approximately 65,000 CY. The unique challenge of this project was the requirement of hydraulic placement of dredged materials into the upland CDF at Houghtaling Island, 15 miles south of the work area. This involved the design-build of a bespoke hydraulic unloading pump utilizing a 14” Ellicott booster pump as the main power source. This pump had to push the dredged material 1100’ horizontally and 50’ vertically into the designated containment cells. Two PCB impacted areas delineated by the USACE required dredging with a sealed environmental bucket first, portions of which abutted high pressure natural gas pipelines. This required all work in that area to be done in coordination with the pipeline stewards to ensure precise bucket and spud placement in order to ensure the preservation of these sensitive subterranean pipelines. Upon completion of dredging these PCB impacted areas, clean dredged material was pumped into the CDF to cap this PCB material. The BAI/Ellicott Hydraulic Barge Unloader proved itself to be an exceptional tool for moving homogeneous material. 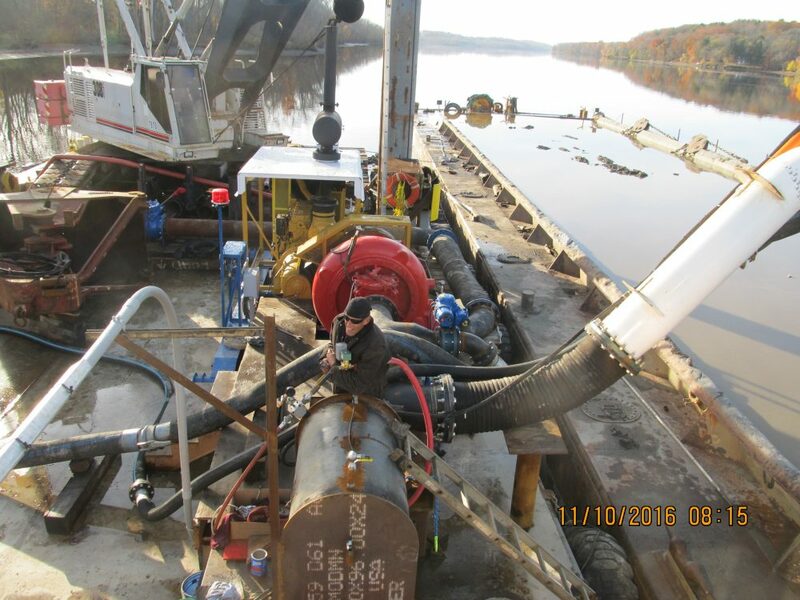 Unforeseen high concentrations of debris hampered sediment transfer production due to blockages in the pump suction that required periodic clearance. Despite these challenges, BAI placed over 60,000 cubic yards into the Houghtaling Island CDF in just over two months before icy conditions and environmental restrictions halted work. There is currently less than 1,300 CY of mandatory material remaining to be removed and is expected to be completed in spring 2017 with an exact date of completion to be determined upon further discussion with the USACE.